*$22,000 is based on 318 participants. Should a greater number of players decide to participate, this number could be reduced proportionately. While this settlement has been described in numerous accounts as “insulting,” which indeed it is if you consider this as reparation for the loss of one’s cognitive ability, it was presented by plaintiffs’ attorneys as “the very best we can do,” and I tend to believe them. I spoke to lead attorney Charles Zimmerman on the phone the morning of the joint press release and he stated, “They fought absolutely everything. There wasn’t any issue in the case they didn’t fight, there wasn’t a one.” Based on the public docket and leaked discovery details, it’s easy to see this was the case. “When you have a defendant who has spent millions of dollars litigating a case for four years to prove that nothing is wrong with getting your brain bashed in, you can only get so far,” another attorney for the players, Stuart Davidson, told the Associated Press. Unlike the NFL settlement players did not support litigation in sufficient numbers to form the critical mass necessary to leverage a high-dollar settlement. After settlement talks began more than a year ago, the NHL for months steadfastly refused any cash payout for to players. When the NHL did finally agree to a payout, the league suggested a sum of about $5K per player was appropriate. Plaintiffs talked the NHL up from that. In view of this, it seems a considerable accomplishment on the part of plaintiffs’ attorneys to bump them up to $22,000, plus the $4,000 payout to the 138 who filed the lawsuit and $10,000 to the six representatives for the proposed class that failed to certify. The NHL apparently didn’t let up even after agreement was reached. According to TSN’s Rick Westhead, “When the NHL & plaintiffs agreed to issue a joint press release to be sent out today, NHL wanted language claiming no link has been established between repeated head hits & long-term brain illnesses.” They effectively asked plaintiffs’ lawyers to derail the case of any client who didn’t opt-in to the settlement. Appropriately they didn’t budge, and this did not appear in the joint release; only that the NHL continues to claim no relationship between getting one’s head repeatedly pounded and permanent brain damage. Lawyers have waived individual contingency fees for clients accepting the settlement and negotiated a $6.9 million attorney fee to be paid by the NHL. According to Law360, $4 million of this is simply recovering costs with the balance to be split among several law firms for 4+ years of work. In this instance, neither the lawyers nor the players are getting rich. I’ll make clear from the beginning, I’m not a lawyer and I can’t offer legal advice. 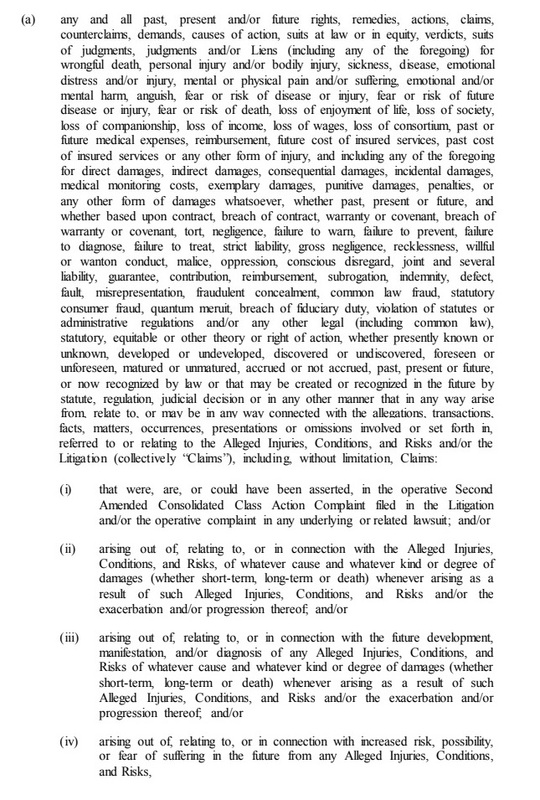 That said, I have a fair amount of experience in reading and interpreting contracts and as I read the settlement agreement which plaintiffs’ attorney Stephen Grygiel described as “very complicated,” I noticed some provisions that seemed cause for concern. I directed my concerns to some neutral legal experts including, attorney Eugene Egdorf of Schrader and Associates, who has conducted successful brain injury litigation against the NCAA; Associate Dean for Academic Affairs and Professor of Law at the University of Baltimore Dionne Koller; and University of Georgia School of Law Professor Elizabeth Chamblee Burch, who teaches civil procedure and complex litigation, and whose groundbreaking work on MDL issues has been published in numerous prestigious law review journals. To be clear, the settlement dictates that every player who opts into the settlement and requests an examination within 75 days will receive one from a participating neuropsychologist. No misrepresentations here. Upon recommendation of the neuropsychologist if a player shows diminished cognitive function in two or more domains, he may also receive an examination from a participating neurologist. No misrepresentations in this respect either, however no imaging, such as an MRI or PET scan will be paid for by the NHL. This may not be entirely clear to former NHL players. 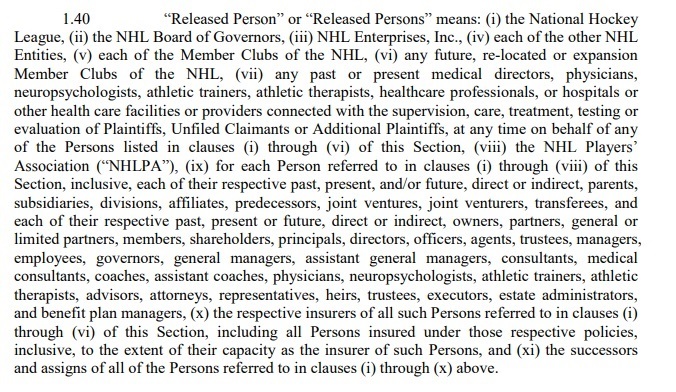 The NHL also stipulates that it will not pay for additional testing if impairment in two cognitive domains isn’t identified, but rather these players can seek funds for more comprehensive testing from the Additional Payment Fund. The NHL reiterates throughout the agreement that aside from the express obligations of the settlement it will take no further responsibility. Without a doubt, this affirms the lack of compassion the NHL has for its retirees. A potential life and death situation is noted, in which the NHL essentially says “live or die, we don’t care, just don’t ask us for any money.” Players are instructed to file a claim from the Additional Payment Fund—if they live long enough. Section 9 of the Settlement Agreement sets the stipulations for testing and the Additional Payment Fund, the bulk of which relates to testing. Six onerous single-spaced pages present in careful detail the NHL’s limited responsibilities and the unseen cost of availing one’s self of the testing benefit. Testing will be performed by members of Sports Neuropsychology Society. Without taking the time to research the numerous neuropsychologists within the organization individually, a quick glance at the website shows that two prominent sponsors of their annual symposium are the NFL and NHL. Some executives also have an NCAA affiliation. That said, the tests specified in the settlement are well recognized and comprehensive. There is no indication the exams will be manipulated in order to deny claims. An important feature in the NHL settlement, which was a big win for the plaintiffs’ attorneys and the players they represent was to negotiate that no unused funds will revert to the NHL. In some settlements money has been allowed to revert and this has resulted in difficult criteria for receiving an award, and plaintiffs who were largely uncompensated. 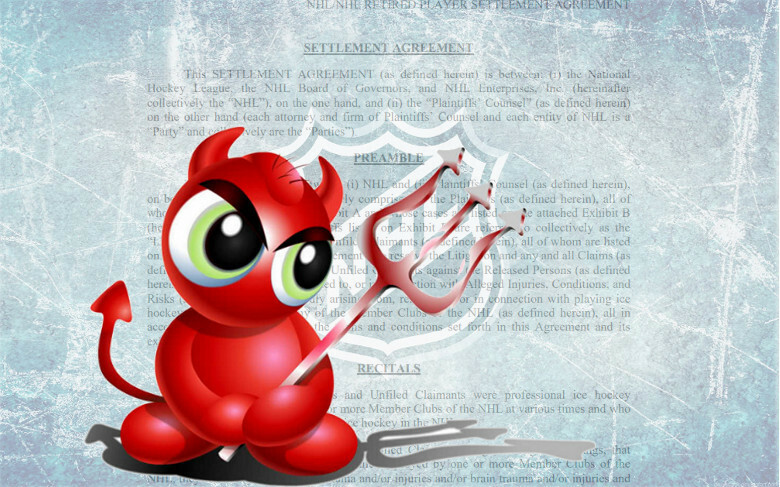 Instead of limiting payouts as the NFL attempts with regularity, the NHL appears motivated to control the data. The players will, of course receive their test results which they can share with a personal physician, but essentially no one else. In addition to the players, however, the Testing Administrator will furnish both plaintiffs’ and NFL counsel semi-annual reports with the stipulation that nothing can be used in research, media, or litigation. The NHL has placed some formidable restrictions on participating doctors, specifically disqualifying any who may have served as an expert witness against or testified against the NHL. Some Boston University researchers were disqualified by name. While the NHL is intently focused on unilateral control of player testing, they seem to have little interest in the Additional Payment Fund, which will be completely administered by the Claims Administrator who will be hired and directed by plaintiffs’ counsel. Their decisions are not appealable for players. This is a double-edged sword for players and places their attorneys in an awkward position. On the plus side, decisions will be made by an ally and not an adversary. On the downside, potential for conflict exists between players and their lawyers because they will not possibly be able to accommodate every request. With the NHL distancing itself from involvement in player compensation, the attorneys will have to work with the Claims Administrator to determine fair distribution of the limited funds. The attorneys will have to make some difficult decisions as to how to best use the funds. Should they grant every request from a player who shows impairment? Determine a threshold of impairment that a player must meet to qualify for a medical award? The settlement agreement doesn’t offer any guidance, likely because a claims administrator hasn’t been appointed yet. The criteria probably isn’t fully defined at this point. It’s also noteworthy that estates may make a claim from this fund. What’s the price of a human life? The entire $1,100,000 available seems grossly inadequate for even one death! As attorney Paul Anderson, another litigator with success in brain injury litigation noted, less than 15 players could qualify for the maximum award of $75,000 from the Additional Payment Fund. Presumptively, estates representing a lost loved one would qualify for among the highest awards. While it seems unlikely that the families of the three deceased NHLers with CTE would opt in, if they did, and if they were awarded maximum payouts, this would consume 20% of the fund with $875,000 to be distributed among the other 318 currently eligible players if all were to choose to participate. If the total was evenly distributed among all 318, each person would receive only $3,459. Average cost for an MRI is over $2,500. One night in the hospital can run between $1,500 and $3,500, and some psychiatric medications can cost up to $1,000 per month, so it’s easy to see the dilemma that the attorneys and claims administrator will face in finding a fair compromise in the crumbs tossed out by the NHL but I do feel they’ll do the best they can with the limited funds. Former NHL players Dave Christian and Reed Larson, named plaintiffs in the concussion lawsuit, will both accept the NHL settlement offer, their lawyer tells me. Players who want to participate must sign a release form within 75 days of November 6. Of course, not everyone will accept the settlement. Mike Peluso also said that he will not accept the settlement. Many are probably undecided. Can more players join the settlement? 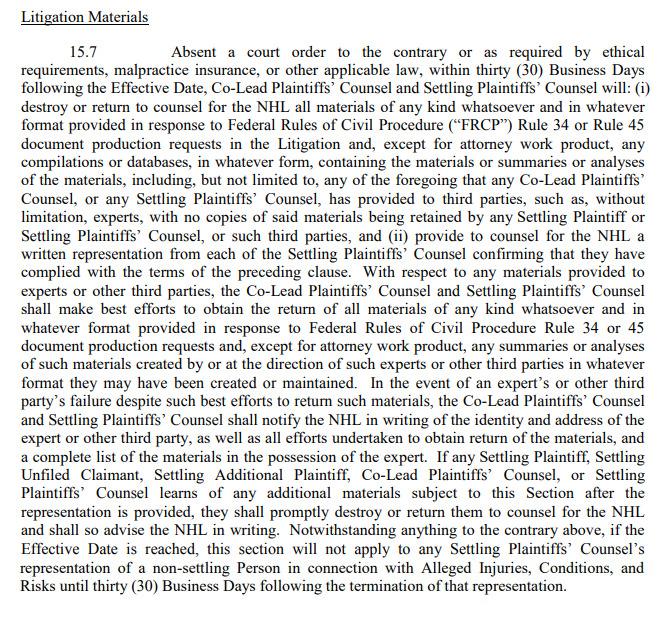 The settlement is structured around the 318 potential claimants who either filed litigation against the NHL or retained a lawyer for the MDL suit. The $6,996,000 compensation figure is based on $22,000 payments to 318 players, however if more than 318 players participate, this amount could be reduced depending on the number of participants. As with nearly every tentative settlement, this one has a “blow provision” allowing the NHL to walk away with no obligation if what it deems sufficient participation isn’t achieved. While it has been widely reported that they may back out with less than 100% participation, it’s highly unlikely they would if a majority of players decided to opt in. 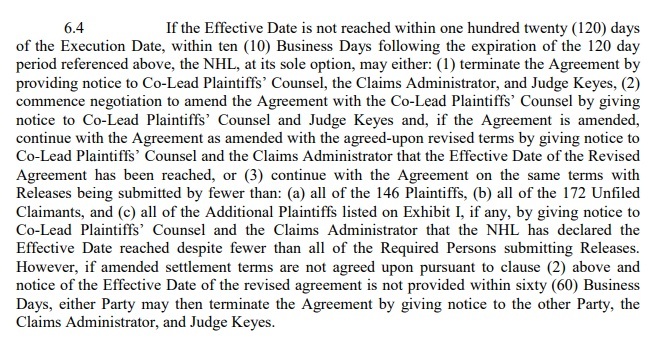 Section 6.4 of the settlement states they can continue with the agreement on the same terms or begin negotiation to amend the settlement if they decide not to terminate. If the settlement is not amended but only 300 players elect to participate, the $22,000 award would not be increased but the surplus of $396,000 would revert to the Common Good Fund. The $22,000 could decrease, however if players not currently a part of the litigation retain an attorney and sign the release to opt in. In the event more than 318 players participate they would still receive an award of $22,000, but the funding for the award would come from the Common Good Fund. An additional 114 claimants would wipe out the Common Good Fund. If 115 additional claimants over the presumptive 318, choose to opt in, awards would be reduced proportionately. What happens if the settlement is amended? This $2,514,000 aggregate is administered by the NHL, but unlike Testing, many stipulations are placed on the Common Good Fund. It is designated as a fund to assist retired NHL players in need but tends to function more like a slush fund for shortages in other areas. $750,000 has been allocated for administrative expenses such as payment for the claims administrator, judge, etc. It is also earmarked to handle overages from the Additional Payment Fund. In the event of a much higher than anticipated participation rate as a supplement for payment of initial awards. If the fund isn’t tapped by one of these provisions the NHL must sign off on any other disbursement of money from the Common Good Fund. If by the unlikely chance funds should remain in the Common Good Fund at the conclusion of the settlement term, any balance would go to the NHL Alumni Association. Any player who opts to participate in the settlement program forever waives his right, and the right of anyone associated with him to sue the NHL for any claim related to head trauma or brain injury. Mr. Grygiel described the scope as, “sweepingly broad releases of all conceivable health-and case-related claims, described with absurd redundancy and strings of nouns so lengthy that analytical vertigo sets in about one quarter of the way through each sentence.” I agree. The NFL’s attorneys have a well-deserved reputation as fierce litigators, but in the area of releases, the NHL’s attorneys have them beat. It would be extremely difficult for a former NFL player to find standing to sue the NFL under the releases in that settlement, but a skilled litigator might be able to maneuver through a few holes in front of an open-minded judge. The NHL squashes this possibility immediately. In view of this, NHLPA head Donald Fehr’s remark seems less than surprising. Of course, when issues involving retired athletes surface, players unions are typically quick to remind that they represent the interest of active and not retired players. As I detailed in my previous story, there are numerous types of liens that may be attached to settlement proceeds, and this is another factor players should consider. In most settlements’ attorney liens are a part of the picture, but here plaintiffs’ attorneys have waived all contingency fees. “I think it was the right thing to do,” attorney Charles Zimmerman said when I spoke to him the morning the settlement was officially announced. Players will still be subject to medical liens, court judgments and back taxes if applicable to their situations. It appears that any cash payments players receive will also be taxable per the IRS. Players may need to seek the advice of a tax accountant to make sure this is handled properly. Adding insult to injury, the settlement, instead of carrying the signature of NHL’s attorneys was personally signed by Commissioner Gary Bettman. Hockey players have an important decision to make and a short time in which to contemplate their options. The information above identifies the not-so-obvious stipulations of the token settlement they should consider. While some settlements receive class certification after an agreement has been reached, this is not the case here. I confirmed with three plaintiffs’ attorneys, Charles Zimmerman, William Gibbs, and Bill Sinclair that they would not be seeking to certify a post settlement class. Professor Burch said that often defendants will offer a sort of “cram down” deal in order to entice as many people as possible into a settlement. This comports with a phone interview I conducted prior to settlement terms being announced with Brooklyn Law School professor Jodi Balsam, who explained that if plaintiffs are not opting in quickly or a stalemate has been reached just prior to reaching a certain threshold, the NHL could announce “everybody gets an additional bonus payment for full participation,” which of course would not only exact pressure from the NHL but from other players who’ve opted in and want to increase their payouts. This is speculation, however and far from certain. Both professors were merely pointing out a possibility based on observations of other settlements. “If the deal falls apart, individuals could pursue their claims and try to get to a jury,” Professor Koller stated. “I think litigation is a tough path for plaintiffs, however. The NHL has decent defenses, and most importantly, causation will be hard to show.” Players will not only need to show that hockey caused their injuries but specifically that they were harmed by NHL hockey unless claims are modified. I did a deep-dive with Derek Helling prior to the settlement announcement on hurdles players pursuing their own litigation will have to clear. Players like Mike Peluso and Daniel Carcillo will have a challenging path ahead as they attempt to hold the league to accountability. They risk the possibility of having their lawsuits dismissed procedurally before they make it to trial. Assuming the settlement reaches Effective Date, they might be offered more lucrative settlements to entice them to drop their lawsuits as has happened in the NFL settlement with Junior Seau and others as a means of making the leftover opt-out lawsuits go away. Considering the NHL’s scorched earth approach, it’s far from certain they’d make an offer but it is within the realm of possibility. If the players decide to push forward for a trial, hopefully they can persuade the jury to rule in their favor. Carcillo has stated that he cares nothing for a monetary award, and should he receive one, he’d donate it to concussion research. His goal is to finally force the NHL to accountability and get them to acknowledge the link between hockey play, brain damage, and potentially CTE. I hope that he succeeds. I’d like to extend deepest thanks to the attorneys who generously gave of their time to wade through nearly fifty single-spaced pages of tedious legalese to share their expertise for our readers.